Have you ever walked into a Starbucks for your daily caffeine fix, heard the music playing and thought to yourself, “Man, this is my jam, I wish I had this on my playlist.” No? Well, okay, but just in case this ever does happen, you’ll be covered, as the coffee giant has partnered with Spotify to allow customers to take more than just java home with them. Starbucks announced Tuesday that customers at nearly 7,500 stores will now have the option to use the Starbucks Mobile App to identify music playing in stores and then download the track to the Spotify app for later listening. The “new era of music,” as Starbuck is calling it, also allows customers to “love” a track to help influence future playlists at the participating store. “Music has played a pivotal role in our stores for over 40 years and we have been at the forefront of how to integrate it into a retail environment,” Howard Schultz, chairman and CEO of Starbucks, said in a statement. 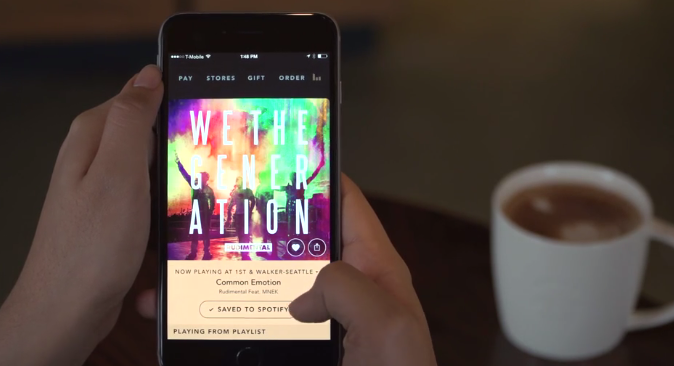 Tuesday’s announcement is just the latest music collaboration between Starbucks and Spotify. In May 2015, the two companies announced they would work tighter to revamp the music stylings at the coffee chain, including allowing employees and customers to pick the songs played in stores.